I've been receiving a number of queries about the plants in this tank, seems there is some interest in them. I'm new to these plants too, so this is also a learning experience for me. To share some additional insight and a closer look, here are some of my own preliminary observations on the various plants in the tank. The stems and leaves on this plant are strong. 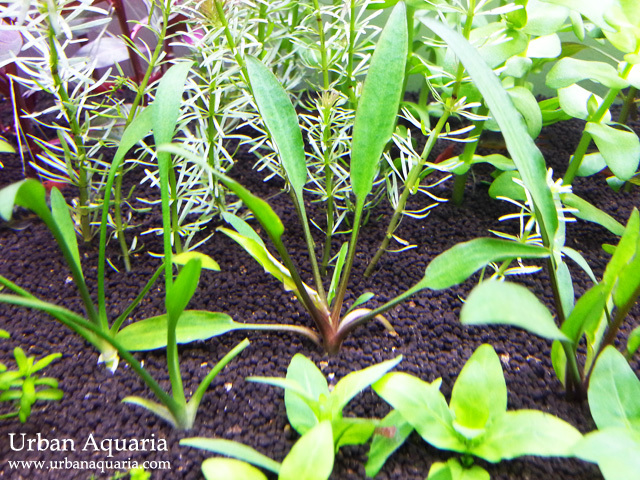 Easy to plant into the substrate and it grows side roots very quickly. Very interesting plant, it has leaves which range from green on the bottom to pink at the top. The leaves have an whitish vein patten which is apparently caused by a virus in the plant that blocks the production of chlorophyll in the leaf veins. The virus is only specific to this plant though. This plant is a fast grower, so i'm looking forward to propagate it for my other tanks once its starts growing taller. 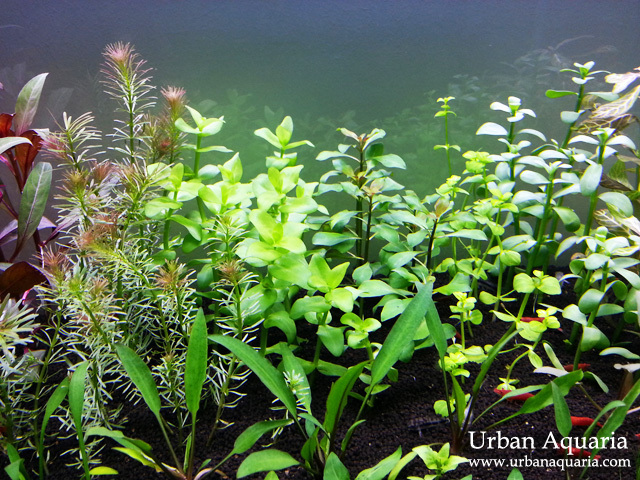 On a side note, as the current flow at the left side of the tank is much stronger, i found that the Hygrophila Polysperma 'Sunset' ended up getting constantly buffeted around and bent by the strong current (this plant has rather soft stems and leaves), so i swapped its position with the Ludwigia Glandulosa (which has a much stronger stem and leaf structure). 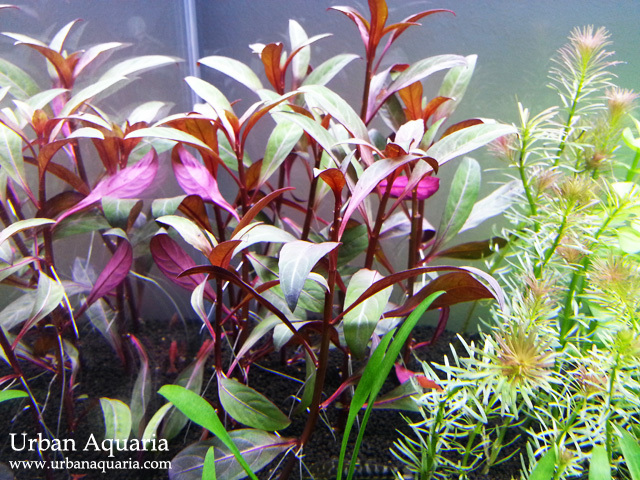 The top leaves of Rotala Wallichii have a nice pink/orange coloration. The leaves actually close up during the night and open up during the day. Bacopa Caroliniana has spade shaped bright green leaves, while in contrast Bacopa Monnieri has rounded tear drop shaped leaves with a more neutral green color. Ludwigia Palustris has a deep maroon coloration on the stems and undersides of the leaves, with the reddish color fading into green at the tips. Lindernia Rotundifolia 'Variegated' has round light green leaves with a striped patten, at certain angles they kind of resemble mini watermelons! 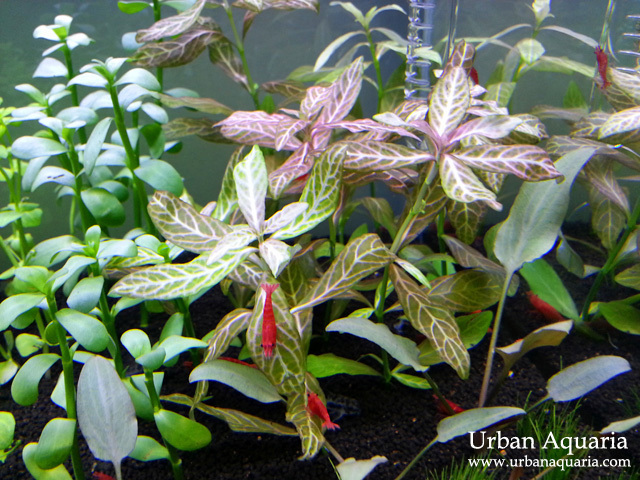 Cryptocoryne plants are relatively low demand, adaptable to different conditions and come in a wide variety of different shapes and sizes, ideal for both low and high tech tanks. Interestingly, the ones in this photo were only planted a week ago and they have already started sprouting fresh new leaves. Overall the plants seem to adapting well to the tank conditions so far, hopefully over time they'll grow large enough to be propagated too. I had some aquascapers mention to me recently that it looked like Alternathera Reinekii "Roseafolia"... but you're right, it does look more like Ludwigia Glandulosa as i notice the leaves have a dispersed leaf arrangement (ie. 1 leaf per node). Will update my posts on the correct plant ID name.